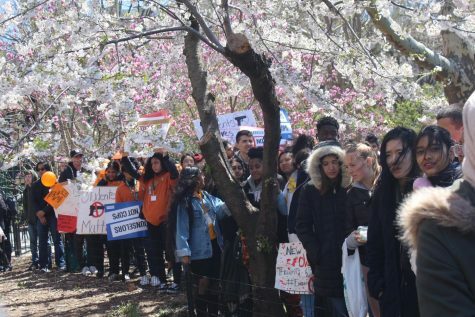 Around 60 students walked out on April 20th, with 20 deciding to leave school to attend the New York City rally. 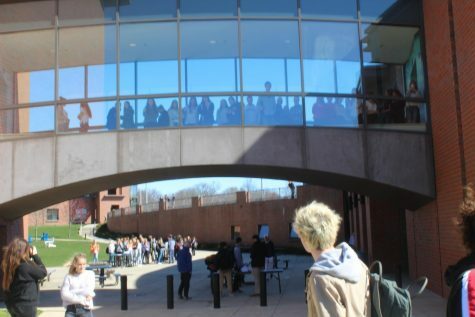 Seen here are students observing from the sky bridge as another group of students heads out to walk to Noroton Heights Train Station. We’re all huddled together near the sky bridge waiting to receive directions. Juniors Nick Giotis and Meaghan Dempsey, fellow walkout students, stand on top of a table and announce to the crowd about what is about to go down: a walk to Noroton Heights Train Station and then a train ride to New York City. It’s 10:15 a.m. and I should be in my Spanish class learning a tense called “el voseo.” Instead, I’m here surrounded by fellow peers, administration, and the police. Students watch from the windows as we sign our names out and begin to leave. Conservatives, liberals, and independents are in this group walking to the train station, which helps to represent a wide range of beliefs on the issue of gun control and school safety. We are well aware that we could possibly face a suspension for doing this (as the handbook states that leaving school grounds as a group calls for this), yet we know that this action is not to solely defy administration. We know that we are doing this for a greater cause that is above ourselves. 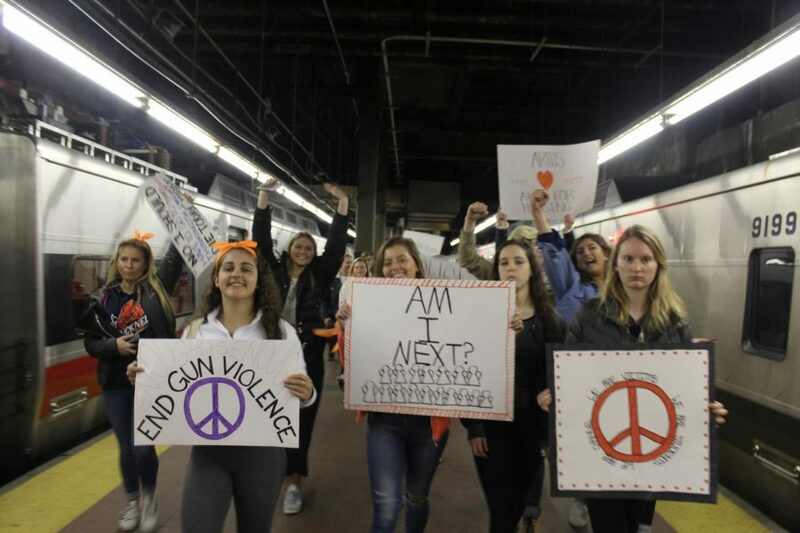 Bringing awareness to Darien and advocating for ways to combat gun violence is worth having a label on our school record. Cars honk their horns in support of us as police cars are seen on side streets making sure that we arrive at our destination safely. The group arrives at the train station after walking for more than a mile, where we are then met by News 12 reporters. 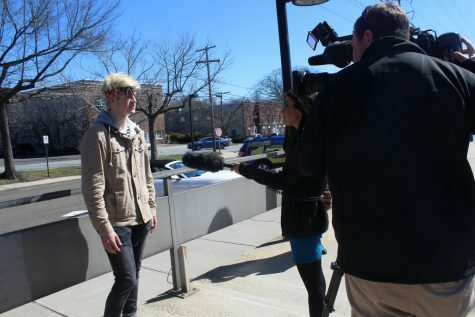 Junior Nick Giotis being interviewed by News 12 about walking to Noroton Heights Train Station from Darien High School. We sigh with relief as we now have time to collect ourselves, buy train tickets, and talk to the reporters. Nick Giotis and sophomore Sophie Howard give their responses to the camera while the rest of the group sings along to “Get Up, Stand Up” by Bob Marley. They finish their interviews just as the train arrives. Two hours later we are standing in Washington Square Park alongside thousands of other students. Students from New York, New Jersey, and even Connecticut towns farther north of Darien are here listening to speakers and chanting for change. A speaker who survived Columbine and the Pulse Nightclub Massacre gives a heartfelt speech while other students lead more speeches and chants. The president of the American Federation of Teachers, Randi Weingarten, tells the crowd about the AFT ending their partnership with Wells Fargo after the bank decided to still support the NRA. Then an eight-year-old, an eight year old, gives a speech about how this is effecting him at such a young age as well. Afterwards, all the students chant “This is what democracy looks like!” The rally lasts for about three hours; looks of exhaustion, indignation, and discontentment are evident on students’ faces as they begin to leave at 3:30 p.m.
Local coverage of our walkout comes out that same day, and many still assume that our walking out was under the guidance of history teacher Ms. Jennifer Ladd, a leading activist in this issue. While we walked out on our own accord, Ms. Ladd was certainly a source of inspiration and guidance. Juniors Katie Simms and Lily Kulesz on the streets of NYC heading to the rally. 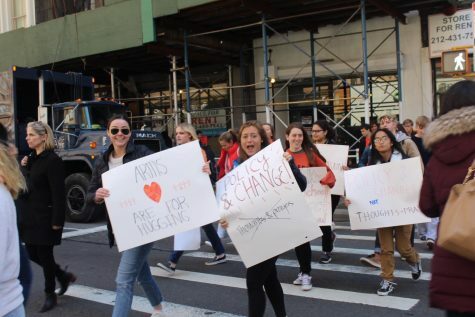 This issue of gun control and school violence has affected teachers, students, parents, and administrators alike (not even included the whole rest of the community), and the voice that is finally being heard on a national level is, of course, the students. Yet, adults are quick to label this voice as just being that of “those kids” and not students who have grown up worrying about someone entering their school and killing their fellow peers and teachers. The undermining of students’ voices is seen with the congressmen, the ones who need to be listening the most. Ms. Ladd, who attended the town hall meeting in Greenwich with Senators Chris Murphy and Richard Blumenthal, said a student asked the senators why adults are dismissing them and saying that they don’t know what they’re talking about. Students from schools in New York City and surrounding areas joined the rally held at Washington Square Park. While a lot of the students who decided to walk out may receive a disciplinary action, such as a detention or suspension, many of them say that going was definitely worth it. Moving forward, students are ensuring that come November they will vote out those who don’t support the changes that are necessary in combating the gun violence issue. After that, the driving force of power in the country for change will be the students, except this time they will have their fair say as adults. 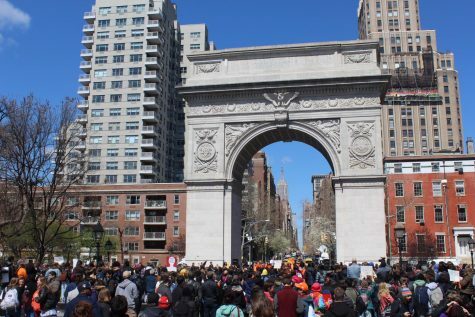 The rally at Washington Square Park saw thousands of students come together protesting the gun violence in schools and in America overall. Notable speakers included a survivor of the Pulse Nightclub Massacre and Randi Weingarten, the president of the American Federation of Teachers (AFT). If you want to read more about student activists at DHS click the link below!